Traveling internationally involves risk, whether you travel for business or pleasure. An emergency, while traveling, may require care, hospitalization or medical evacuation. Or you may need family members to come to your aid during a personal emergency while traveling. 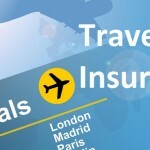 Medicare does not cover clients traveling outside of the United States and recommends consideration of a separate travel health insurance policy. Foreign visitors and new immigrants do not qualify for most domestic health insurance and a travel health insurance plan can bridge those gaps in coverage. 25% of travelers require some type of significant medical care while traveling. International medical evacuation and air ambulance can cost over $90,000!